Winter is a time to tend to the forests, when the trees have less sap and can be cut. 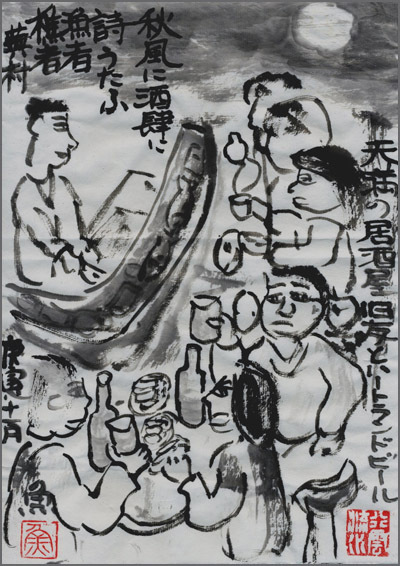 Making charcoal was also mostly done in winter during the agricultural off-season (nookanki 農閑期). In some parts of Northen Japan, especially in Sugakawa 須賀川, the branches of old peony plants are cut off and burned at night at a temple or peony park. The flames have a violet and greenish color in the cold winter night. The fibers of the bark were used to make tough cloth or hemp-palm brooms. This tree grows to a hight of about 5 meters in the forest of the warmer parts of Japan. When the bark is peeled off, it will grow back soon. In former times, the wooden carriages and carts could not be used in the snowy areas of Japan. They were taken apart, the wheels put up high on the wall, the side panels sometimes used to enforce the northern wall of the home. Or the carts and carriages were just put into a special barn. 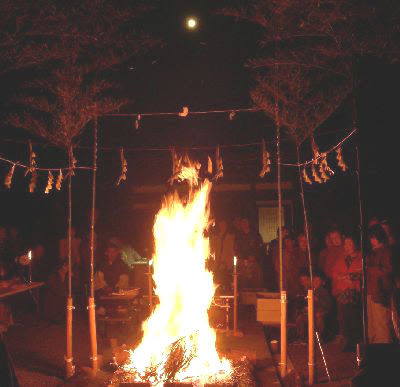 toshigi としぎ【年木／歳木】 "firewood for the New Year"
It was used during the first 15 days of the New Year. a piece of cut firewood with the letters "二月”used as a decoration and burend on January 15. 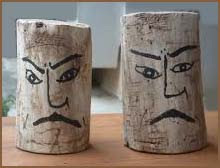 ..... nyuugi (にゅうぎ, 新木) "new wood"
Two simple dolls, male and female, with simple eyes, nose and mouth painted in ink. They are put up at the entrance to the home to ward off evil. This is a custom of the Tohoku region.
. Nyuudoo 入道 priests and goblins . In times without maschinery, that was hard labor. One or two large stems were bound together and transported out of the forest by horses or cows on special paths for that purpose. Some work in the forest during the daytime (higaeri soma) and to home in the evening, others wander around and stay in a small hut for a few days (nagare soma) and then move on to the next job. Making charcoal was not a specialized work, but most farmers did it in the back woods of their home to use as heating. It was also done during other seasons, when they could sell their charcoal well. It takes about a week to cut the necessary wood and fire it in a special kiln.
. sumigama 炭竈 と伝説 Legends about charcoal kilns . In the Edo period, forests were important for the flood control and to prevent soil erosion. Many mountains were declared "closed mountains" of a domaine to protect the trees. Tree felling by private people was not allowed and regulated by the domaine officials for forestry. The nation's forest resources, although abundant, have not been well developed to sustain a large lumber industry. Of the 245,000 km² of forests, 198.000 km² are classified as active forests. Most often forestry is a part-time activity for farmers or small companies. About a third of all forests are owned by the government. Production is highest in Hokkaido and in Aomori, Iwate, Akita, Fukushima, Gifu, Miyazaki, and Kagoshima prefectures. Nearly 33.5 million cubic meters of roundwood were produced in 1986, of which 98 % was destined for industrial uses. The Japanese forest industry has been defeated by cheap wood shipped from abroad. This care for the forest trees is especially important for a kind of cedar, the Daisugi of Kitayama, in Northern Kyoto 北山台杉. Kitayama cedars (Cryptomeria japonica). "Migaki Maruta"
The forest is owned by the same family for many generations, especially in Nakagawa village. your wife and your whetstone!" The tree is usually cut when it has about 20 year rings, which are very narrow to show the strength of the material when used for building. When a cedar becomes 5 to 6 year-old, we cut most branches, just leaving some branches on the top protion of the tree, designated "Hosaki"and the bottom protion, which is designated "Tori-ki" and will serve as a basis for young newly growing branches, in the future. The main trunk is now called "Tachi-ki". After this process, we cut branches of newly growing branches on the "Tori-ki" in addition to the main trunk, "Tachi-ki" every other year until the main trunk grows big enough as building materials. Once we cut the main trunk "Tachi-ki", we select some of the best newly growing branches on "Toriki" for future "Tachi-ki" and cut other branches. Among many young branches, ones growing straight to the sky are considered to be the best. Fore more than 600 years, we have been repeating these processes in order to produce as many logs as possible, and there are some "Daisugi" threes which are more than several hundred years old. We has been growing "Daisugi" cedars to collect logs for more than 600 years. Collected logs had been used to build "Sukiya"-styled tea houses. However, the large demand of logs due to the wide spread of the modern "Sukiya"-style after the World War II exceeded our supply. In addition, some of young logs from "Daisugi" cedars are called "Taru-ki", and they are no longer used to build houses due to a change in the law. Because of these events, the way we produce cedar log changed dramatically and demand of "Daisugi" decreased. . However, the excellent figure of "Daisugi" is now loved by many peope and "Daisugi" cedars are used in Japanse gardens as well as golf yards. Since the tradition has been revived, there are now also some young forest workers who learn the tradition from their peers. Whith small ladders they climb the trees and whack away the branches. It must be done in a way as not to make too large a wound on the tree, in one sharp cut, so that the ast hole will become a beautiful pattern for the log as the tree keeps growing and ageing. The Daisugi trees are also used for bonsai nowadays. They were usually poor folk who spent the winter months in the forest, making a small living cutting wood for the owners of the forest. karyuudo かりゅうど【狩人／猟人】 hunter, huntsman are something different and have a different purpose for going into a forest. Written in 貞亨2年, Basho age 43. Basho was on his way in Nozarashi Kiko and stayed at Yamura in Koshu 甲州谷村 (Yamanashi). 'Yamagatsu' have been written about as far back as the era of Heian Court poetry. One can find various translations of the word on the internet, such as "woodsman," "mountaineer," even "hillbilly." Heian Court poets apparently wrote about 'yamagatsu' from the standpont of peasant exoticness , or from finding unexpected beauty among them. Kubota remarks that in such poems, typical of the court, the speaker places himself physically close to the fence or home of the 'yamagatsu' peasant but, entirely caught up in his own affairs, pays absolutely no attention to the life of actual peasants. "Even when physically at a distance from them, Saigyo notices the people and their livelihood," writes Kubota. 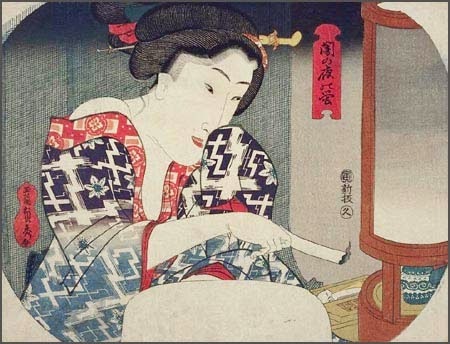 So, what was so remarkable about this "woodcutter" that caught Basho's attention? Were they notorious chatterboxes, so that Basho noted that the tall grass shut one up, from not wanting to get grass in his mouth as he talked and talked? Are these just woodcutters who are cutting and gathering firewood to use for their own fires and to sell to others as firewood? Or are these loggers or lumberjacks, who are cutting down big trees to provide lumber for various kinds of construction? If these are more like loggers/lumberjacks, then woodcutter in English would be misleading. And if they are more like loggers/lumberjacks, how did they get the tree trunks out of the forests? Like they used to do here, with teams of horses or mules, and chains? seem to have been professionals, so "logger" might be a better translation. Firewood for the farmers was cut from the "satoyama" behind the village. It was used for cooking and keeping the open hearth fire in the kitchen of a farmhouse.
. Edo craftsmen　江戸の職人 . tsukegi 付木startwood for fire, "match"
made from scraps of cedar wood with sulphur painted on one side. The sulfur part was held close to a hearth fire and when it caught fire, the scrap could then be used to light another fire or candle in a lamp. By the end of the Edo period there were more than 500 in Edo. They used special tools, one of them the shoojiki 正直 Shojiki blade and a shoojikidai 正直台 stand to use the Shojiki. The scraps would fall on the ground. Kitchen fire in Edo was usually started by the housewife with a flintstone and tinder and needed some skill.
. hiuchi, hi-uchi　火打ち　striking a fire . sanga refers to the mountains and rivers of one's natural sourroundings of ones native place. In spring, trees are grafted or planted. Cut timber and logs used to be transported out of the forest with rafts. Grafting in the WIKIPEDIA ! First many logs of timber are collected at one special part in the river, then all are floated when the water is high enough.
. Gabi Greve, July 9, 2010 - the full story . ***** . Bonsai 盆栽 potted trees . The population of Edo City in the Edo Period exceeded one million in the early 1700s, and became one of the world's biggest cities of the time in terms of population and area. Unlike today's Tokyo, Edo was a city of forest. Half of the city was forest or wooded land, since tree-covered gardens occupied half or more of the estates of samurais, temples and shrines. Edo was once called "City of Mosaic Garden," which depicts the image that the people of Edo had lived in spaces among man-made forests. Another indispensable function of forests was to supply firewood and charcoal. When old inert trees gradually become unable to absorb carbon dioxide (CO2) properly, they are cut down and used as firewood and charcoal for fuel. Both cutting down and planting trees helps young trees to grow vigorously again absorbing CO2. Renovating man-made forests by logging is not the destruction of nature, but necessary forest management. The forests in Japan from the Age of Provincial Wars to the early Edo Period were not in good condition, since the cultivation of new paddies were promoted and people cut up their neighboring natural forests for clearing. In the late 1600's, the shogunate realized the danger of further forest clearing and issued a regulation called "Yamakawa Okite" to stop the deforestation. Furthermore, the feudal domains started investing labor and capital in the existing paddies and fields, and began planting trees on the mountains. This was the beginning of "the Era of Man-Made Forests". In the Edo Period Japan, next to the big cities were always the regions of thriving forest industry. The more big cities developed, the more fuel they needed, which boosted forestry in the neighboring areas. Even the fields of pampas grass were made into man-made forests to satisfy the increasing demand for fuelwood. The importance of mountain trees was taught at temple schools in the Edo Period. When children started reading elementary Chinese classics, they first learned the phrases on the importance of forests: "A mountain without trees is of little worth however high it is, so is a big man without wisdom." Thus they were taught that trees to a mountain are no less valuable than wisdom to men. People in the Edo Period were far more aware of the importance of forests than us, or their descendants who have become ignorant of the natural environment. Our ancestors were well aware that they could neither drink water, grow rice and other crops, nor obtain fuel without forests. "botan taku" - burning peony branches. while grafting trees . . .
Charcoal is being made in a kiln. The wood used is that of a cherry tree. The resulting poem is a succinct and poignant expression of Buddhist impermanence. Located to the Eastern side of Sanjugenborikawa (Sanjukken Canal) , from sub-district 1 to 7. In the beginning of the Edo period, many construction workers using large timber saws 木挽 lived and worked here. They are still popular to our day. The Kiso region was famous for its forests and wood workers. Even a beautiful sight, if seen often enough, can grow old. Note the musical fun that Issa has with the phrase, hatetaru hotaru.
" 'Aki-kaze', 'the autumn wind', is the season word. 'Ya' is, as usual, a grammatical compliment that emphasizes the poetic sentiment and tempers the semantic structure. 'Teiregi' is is a little plant that grows naturally only in a stream that flows by Sairin-ji, the forty-eighth temple of the pilgrimage, in the village of Takai, now part of Matsuyama; its tiny leaves add a prized pungency to the soy sauce that accompanies 'sashimi', fish eaten raw. 'Tai' is a sea bream that the Japanese consider the best of all fishes, invariably served at banquets to celebrate happy occasions. Mitsu is the port of Matsuyama, site of a large fish market. "Though it falls flat in translation, to a native of the area Shiki's haiku is loving praise of local dishes, achieved by a simple juxtaposition of proper names, intimate and lovely to the ear. It is fitting that it is engraved on a stone that stands in front of Sairin-ji. " "The nature of haiku, with its limitations in time and place, naturally invites the haikuist to use local names. Unlike Western poets, haikuists have never presumed that their efforts would reach a nationwide audience. All through its history, haiku has been a literature of a limited group (called 'renju') who were familiar with the local names of their area and enjoyed using them in their haiku. (October 1974)"